The elections to the Greek Parliament of June 17 were needed because after the elections of May 6 no parties were able to form a coalition government. The result, not unexpectedly, was a “victory” for the rightwing New Democracy (ND), with 29.7% (compared to 18.9% from May 6). The left alliance SYRIZA rose from 16.8% (May 6) to 26.9%, but was again only the second strongest party. Thus, the 50 “extra” seats in parliament, decisive for the formation of a government, were captured by the now leading memoranda-party ND. ND is forced, however, to form a coalition government with the badly shrunken and discredited ex-social democratic PASOK, the third strongest party, with 12.3% (a decrease of 0. 9%). DIMAR, the right-wing split from the SYN-party (the leading force in SYRIZA), will also be involved in the new government. DIMAR polled 6.3% (+0.2%) and is thus the sixth strongest party. For the first time, DIMAR openly takes over responsibility for the memoranda policies. The “Independent Greeks,” a spin-off of ND, who refuse to support the memoranda policies, achieved a fourth place finish once again, with 7.5% (- 3.1). The neo-Nazi gang of Chrysi Avgi (“Golden Dawn,” GM) is now in fifth place, with 6.9% (- 0.1). The stabilization of the neo-Nazis is even more remarkable since their terrorist character was openly revealed in the weeks after the May 6 vote, with open attacks on immigrants and leftist politicians using knives and clubs—in full public view. Nobody can say any longer that the voters do not know what they were voting for. The Communist Party (KKE) received just 4.5% and lost 4% compared to May. All parties below the 3% threshold on May 6 had high losses and became almost insignificant for the outcome of these elections, including LAOS with 1.6% (- 1.3), “Dimourgia Xana” with 1.6% (- 0.6), the “Green Ecologists” with 0.9% (- 2.0), and [the far-left coalition] ANTARSYA with 0.33% (- 0.9). The valid votes cast represented 61.5% of the electorate (- 1.2), again significantly lower than ever before. A closer look at the election result shows that the shift between “right” and “left” compared to May 6 is not very big. The right-wing parties (from ND to GM) together polled 47.3%. The percentage of PASOK as a “new” right-wing party should be added to this. The left received altogether 39%, taking into account also DIMAR and the Greens. The memoranda-parties, so far ND and PASOK, but now DIMAR too, scored together 48.3%, and of course have a clear majority in Parliament. In accordance with the rules of bourgeois parliamentarism, this might be interpreted as providing a “democratic mandate” for the continuation of the memoranda policies. Nevertheless, this “mandate” is, even in a formal sense, quite weak. ND’s ”success” must be partially attributed to the unprecedented propaganda campaign of the memoranda parties and the mass media in Greece and other European countries, according to which an electoral victory of the left would have meant Greece’s immediate exit from the euro, the absolute economic ruin of the country, the termination of all payments etc. In addition, ND was able to attract most of the traditional right electorate that was very fragmented on May 6. As for the left-wing parties or alliances and their prospects, it should be noted that the slogan “Elections now!” issued by the two leading reformist parties, KKE and SYRIZA, especially since the great general strike of October 2011, represents a strategic failure. It was not possible to stop the memoranda policies through parliamentary elections. The relative strengthening of the Left as a whole in the two elections was the result of the large mobilizations of social resistance from May 2010, with its high points of June and October 2011 as well as Feb. 12. It must be understood that the resistance was not strong enough to bring down the memoranda policies. Thus it is not accidental that the strength or weakness of the entire left in the elections reflects the real balance of power between the main classes in Greek society. In this respect the election results are the political expression of the temporary defeat of the resistance movement. The weakening of KKE in the elections can be partly explained by its resolute “isolation tactics” along with its strict refusal to cooperate with other left forces at any level. This is connected to a necessarily complete lack of any prospect designed to end the prevailing policy, whether it be by strengthening the resistance movement or by the (ultimately illusory) parliamentary path. The SYRIZA leadership has taken clear steps to carve out space as a “left” alliance for the management of the existing political and social system—i.e. Greek capitalism—at the government level, particularly after May 6. Still, it is obvious that the ruling classes of Greece and the EU prefer to get along without the services of SYRIZA in this regard. The SYRIZA leadership has fully accepted the logic of the Troika credits and their principal legitimacy and thus the debt repayments, at the same time also the wage and pension cuts and the general lowering of living standards imposed by the first memorandum, as well as the prospect of remaining in the euro-zone. These things were seen as the primary objective of government policy, thus accepting the “legitimacy” of the extortionate dilemma posed by the ruling classes. In this way, the main demand of last year’s movement “We owe nothing, we do not pay, we do not sell!” was completely diluted, or turned into its opposite. On the central issue of migration the SYRIZA leadership succumbed in large part to the prevailing policies and declared immigrants to be a “problem.” The SYRIZA leadership has not said a single word about how the social resistance can be put back on its feet or how the deadly threat posed by the neo-Nazi hordes can be stopped. For ANTARSYA the election results of June 17 are almost tantamount to a collapse. All of the weaknesses of this formation after May 6 have become blatantly clear—for example, its lack of coherence at the central level as a result of an inability to overcome the egoism of various organizations, the weakness of the basic units of the local committees, an inability to confront the political situation after May 6, to take a stand and respond clearly and convincingly to the central issues. ANTARSYA must make the necessary self-criticism in the face of this defeat and draw the appropriate conclusions. It can hardly continue if it fails to do so. Only in this way will it be possible for ANTARSYA to develop as one of the main engines of the resistance movement and as the anti-capitalist and revolutionary pole of the left. There is no shortage of starting points for joint actions by the entire left in the spirit of a united front policy. The programmatic perspective for the battles ahead has, to a large degree, been correctly outlined by ANTARSYA. The class struggles will undoubtedly sharpen in the coming months. This is what the social resistance must prepare for. 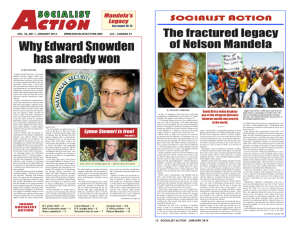 > The article above was written by Andreas Kloke, and is reprinted from the July 2012 print edition of Socialist Action newspaper.